Join Goofy and his son Max in a hip and hilarious all new movie that kicks up outrageous fun on the road to higher education. It's all extreme sports and a life of freedom as Max sets off for college - but Goofy misses Max so much, he literallly falls down on the job. The laughs come fast and furious as he shows up, leisure suit and all, to finish college alongside Max and his friends. 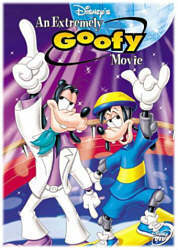 When Goofy meets the librarian, they hit it off and spark a stuck-in-the-seventies disco inferno that steals the show. But as Goody tries to get closer to Max, both must go to the extreme to learn how to live their own lives...together! DVD: Widescreen 1.66:1; audio English DD 5.1; subtitles: none; closed-captioned; single side-dual layer; 21 chapters; rated G; 76 min. ; $29.99; street date 2/29/00. Supplements: "Kid's Goofiest Jokes" Bonus Program; Interactive Trivia Game; "Me And My Dad" Interactive Read-Along; Cleopatra's "Right Back Where We Started From" Music Video. Maybe I'm just an old curmudgeon, but I simply can't get used to this whole "modern" Goofy who actually has a son. For one, it's tough to imagine the Goof ever getting anywhere with a babe; of all the major Disney characters, he always seemed the most asexual to me. But more than that, it just looks odd to take a moron like Goofy and put him in a position of being a responsible adult; yeah, the situation can yield a like of comic situations, but there's something troubling about the whole scenario. Or maybe I just think about it too much. I don't know which it is, but I do know that I've never been able to warm up to the cartoons that feature Goofy and his son Max. As such, it's probably not much of a surprise that I didn't care for the most recent effort, the straight-to-video release called An Extremely Goofy Movie. This picture is a sequel to 1995's theatrical offering, A Goofy Movie. I don't recall that project being much of a hit, but since it - and other efforts like this year's The Tigger Movie - are produced by an arm of the studio's television department, they're much cheaper than the regular theatrical animated films and as such can turn a profit pretty easily. Make a few million in theaters then rake in the inevitable home video bucks; seems like a good scheme. Unfortunately it doesn't seem to yield any good movies. I haven't seen AGM yet - that'll have to wait until it hits DVD in June - but I doubt it'll be much of a film, since none of the other Disney "non-classic" titles have done much for me. AEGM falls firmly into that same category; it's not unwatchable but it doesn't offer anywhere near the level of pleasure and enjoyment that I get from even the less-compelling "full" animated releases. I think one reason I dislike the whole Goofy/Max thing is that feels like such a contrived attempt to bring a classic Disney character "up to date". They've done that a lot - remember "Mickey Mouse Disco"? - but never with such far-reaching aspirations. This isn't just a one-off thing; they've completely altered the dynamics of the Goof's lifestyle. Of course, he remains as stupid and simple as ever, though with a modicum of fatherly wisdom at times. Really, AEGM doesn't have all that much to do with the Goof himself; he's a supporting character in his own film. Max and his buddies are really the stars of the show, and it focusses on the tie-in happy plot wherein Max and his gang go to college and try to beat a leading fraternity at the X-Games. The plot is predictable and banal; anyone who doesn't know who'll win the X-Games might as well just jump off a bridge right now. Anyone who also doesn't know that several moral lessons will be learned along the way hasn't paid much attention to this genre. But unpredictability was never a strong area for Disney films; virtually all of them follow easily anticipated paths. The fun was in the ways we got there, but that enjoyment lacks in AEGM. It's a completely unmemorable story that makes vague attempts to be hit and ironic but just seems lame. When Pauly Shore voices one of the more interesting characters, you know you're in trouble. An Extremely Goofy Movie appears an aspect ratio of approximately 1.66:1 on this single-sided, single-layered DVD; the image has not been enhanced for 16X9 televisions. As is typical of the Disney animated films, this one looks pretty terrific. Sharpness seems consistently crisp and well-defined, with only a few very mild examples of softness to be found. I detected no evidence of moiré effects or jagged edges. The print used for the transfer appeared clean and smooth; I saw no examples of grain, scratches, speckles or other defects. Colors looked a bit subdued but seem appropriately saturated and accurate, with no signs of bleeding or noise. Black levels appear deep and rich, and shadow detail was consistently opaque but not overly so. All in all, the movie offers a thoroughly terrific image. The film's Dolby Digital 5.1 soundtrack wasn't quite as good, but it seemed strong as well. The forward soundstage is absolutely fantastic, with a very broad and well-defined image. Sounds panned between the front three channels smoothly and realistically, and everything seemed appropriately placed within the spectrum. I found the use of the rear channels to be a little disappointing; although they kick in effectively at times, much of the movie declines to use the surrounds. In general, I found the occasions during which the rears are in action to work nicely, but I thought they were underused. Quality seems good but features one significant flaw: too little bass. The LFE channel only kicked in one a few very rare occasions, and in some instances that's okay; for example, Tarzan doesn't even include an LFE channel but it still offers some solid bass. However, that's not the case with AEGM; some low end kicks in at times, but for the most part, I thought the audio seemed thin and lifeless. Effects come across decently, with realism and crisp tones; they also offer the most bass. Dialogue sounds natural and integrates well with the action. Music suffers the most from the lack of low end; the film features a lot of pop/rock songs, and with the exception of the tune that runs over the closing credits - which features the only sustained use of the LFE channel - the music sounds too flat. Despite that weakness, AEGM still offers a decent soundtrack. It doesn't give us too many supplements, though. Two features that are becoming standard for Disney DVDs appear; those are a 16-question trivia game (easy for anyone who watched the film - obviously it's aimed at little ones) and a "Read-Along" storybook. The latter is more interesting than most, since the story in question doesn't simply repeat the plot of the movie; it's a completely different tale, and it's told by "Max" (Jason Marsden), which is a nice touch. In addition, we find a couple minutes of "Kids' Goofiest Jokes". In this we find some wee ones who tell us some crummy kid-oriented quips. My complaint? No profanity! What's wrong with the younger generation? We also find a music video from annoying girl group Cleopatra, not-very-famed for their obnoxious single "Cleopatra Comin' Atcha". They perform a version of terrible Eighties song "Right Back Where We Started From". The original stunk, and the remake doesn't improve upon it. The video itself is one of the lamest ever concocted; it shows shots of the girls in the studio intercut with movie scenes and clips from a different Cleopatra video. They were too cheap to even attempt a real video! Yuck! We get some DVD-ROM features as well. Since I don't have a DVD-ROM drive, I can't test them, but their description seems to indicate that there's not much for DVD-ROM users that can't be accessed on a standalone player; from what I could see, the only difference is that the DVD-ROM area provides some Internet links, which are easily found by anyone without a DVD-ROM drive as well. Maybe there's something different in there, but I saw no indication of that. One last comment about this DVD: like many other Disney offerings since February, it includes advertisements for other Disney releases at the very start of the disc. Many people hate these, but they don't really bother me. However, I can easily skip them on my player, and I've heard that others don't always find this so easy to do. Love 'em or hate 'em, I just thought I'd warn you that they're here (and they're queer, so get used to it). Maybe someday I'll find a Disney animated I like that's not part of their "classic" line, but it won't happen today. An Extremely Goofy Movie is another in a series of mediocre and generally uncompelling cheaply-animated films; it's watchable but lacks any sort of spark or cleverness. The DVD itself offers a typically-fine picture and good sound, but it lacks many interesting supplements. Your kids might like AEGM, but that's about it, and they'd probably be better off with one of Disney's good movies like Tarzan, Mulan or a A Bug's Life. As for adults, AEGM isn't even appealing for die-hard Disney fans.